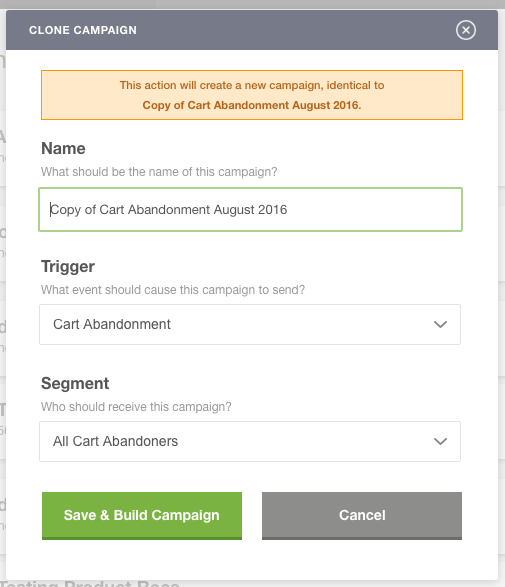 In this tutorial, you'll learn how to clone a campaign from your Email Campaigns Manager. Rejoiner makes it easy to duplicate campaigns you've already used. Just follow the steps below. This will then trigger a modal window with an alert. The alert is just to let you know that you're creating a copy. This modal will have several selections that you'll need to complete. First, you should re-name the copy of your campaign. We recommend keeping your campaign's name simple, but descriptive. Next you'll select the Trigger for your campaign. This could be the same, or different from the original. Then you'll select the Segment who you want to target. This could be the same, or different from the original. If you're cloning a campaign that either is in testing or was in testing you'll need to decide whether you want to copy the entire test or just the control. Note: Cloning the Control + Variant means that you are also copying the test parameters of that campaign. After re-naming your campaign and making your selections, you should be ready to save & start building your campaign. Finally, you should see a confirmation of your cloned campaign after clicking the "Save & Build" button. Your cloned campaign will appear as paused and no customers will receive Rejoiner emails for that specific campaign until you activate it. This should allow you to make any needed changes to your cloned campaign. When you're ready to activate the cloned campaign, click the Activation toggle to the right of the campaign name. The campaign is paused when the toggle is red and the campaign is activated when the toggle is green.